Looking for something fun to do this month? Take the whole family to Kidsfest! This year's Kidsfest is June 9-12 at The Forks in Winnipeg. Kidsfest is put on by the Winnipeg International Children’s Festival, who has been entertaining children and their families for over 25 years with positive educational entertainment - in a festival environment created just for them. 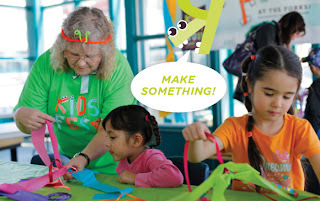 I went to check out www.kidsfest.ca to see what types of activities they have planned. First off, you should check out their website. Not only is it fun and colourful but it’s so well laid out and easy to find what you’re looking for. The site is loaded with details of the upcoming event. Dress up & make a wacky hat! So what will you expect to see at Kidsfest this year? They have everything from zany circus acts, high strung acrobatics, kidstock for the music lovers and loads of arts and crafts (a momstown Winnipeg favourite)! Arts & Crafts is a momstown Winnipeg favourite! Fred Penner and The Cats Meow Band will be there, along with Dallas Arcand, a high energy Aboriginal entertainer. And of course there is good old traditional face painting! The list is too long to mention everyone. Check out their website for the full line up of performers and the fun activities they have planned. Last but not least, they will have fireworks for the whole family to enjoy! Fred Penner is a childhood favourite for me! 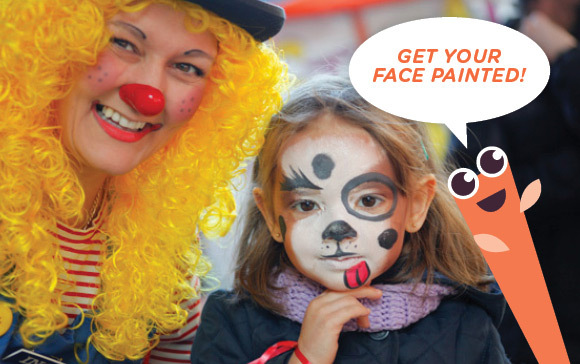 Who wouldn't want their face painted? Tickets are now on sale. Hurry before June 12 to take advantage of their advance ticket prices. Available May 9 – June 12 at all Winnipeg Safeway and Assiniboine Credit Union locations. Cost is $12 each or a Family Pack of 4 for $40. Or you can purchase tickets at the gate: Available June 9 – June 12 at the Box Office onsite. Cost is $14 each or a Family Pack of 4 for $48. Free admission for children under 2 years of age. Children under 12 pay once and then can visit the Festival again and again (they just need to report to the Box Office with their attached wristband and trade it in daily). Want to win tickets? We’re giving away a family pack of 4! Simply make a comment here as to which performer or activity your kids would want to see/do the most. 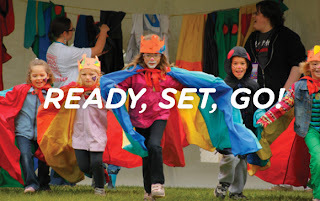 Go to www.kidsfest.ca to see the full line up and list of activities they have planned. We’ll randomly select one lucky reader! Hurry this contest ends soon! Winner will be announced June 5! Be sure to make a comment here as to which performer or activity your kids would want to see/do the most and you'll be entered to WIN! My kids would love to see the circus acts & acrobatics. They are both very active kids and love to watch anything like that. I know exactly what my son will love to do! its the Kee No Say O, the 'dress up tent' as he has called it in the past. I think DD will love the percussion procession. Fred Penner, and the High strung areal dance will be good too, my DS will LOVE to check that out. 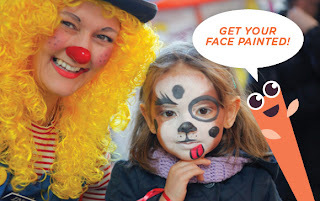 My daughter will enjoy the facepainting and Inch the Clown and the crafting tables! It will be hard to pull her away from the crafts. My daughter would love to see Fred Penner! She loves music and dancing. I think this year she would also enjoy the crafts and facepainting! We love Kidfest and will go regardless! It's an overall good time for everyone! My son was lucky enough to meet Fred Penner at a kids social that we went to. He/we are very excited to see him again! My son is also excited for the "Create-a-cape" tent!!! My daughter is 8 months old but I'm sure that she will enjoy seeing all the kiddies running around! My daughters are very crafty so I think they will really enjoy Bling Fling and Mask Magic. For entertainment I think their favorite will be the High Strung Aerial Dance and Fred Penner. My 3 1/2 year old son would love to see Fred Penner Perform! We brought him to the Teddy Bears Picnic this year and he was so thrilled to see Fred Penner. We stood around waiting for him to play "The Cat Came Back" but we ended up having to miss it as our youngest began to fuss. 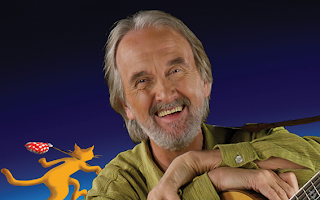 All week long our son has been singing the songs by Fred Penner that he heard at the concert. We'd love to go back for more! Ok so I'm gonna try this again I'm having a hard time getting this comment to post. My son is 3 1/2 yrs old and his two top things to do would be the create a cape and the musical madness. probably both combined. he loves his superheroes like batman and spiderman and can' stop making musical instruments out of everything he finds in the house. OOOoooo - Topsy Turvy Ties, Kindermusik, The Very Hungry Caterpillar.....and we could go on and on!!! Definately Fred Penner, The Very Hungry Caterpillar and Splash N' Boots!!!!! But the rest look good too!! Splash n BOots and musical maddness!! EEk! Can't wait! My 4 year old and 2 year old love listening to Fred Penner's music. They also love doing crafts and getting their faces painted. I think my son would really enjoy Critter Dipping. He's fascinated with everything that lives in the water right now! He'd also probably enjoy all of the music and dancing! My daughter would enjoy colorful creations, and the music. The Very Hungry Caterpillar is a bit hit around here :) My kids would LOVE to see the show!! We are now closed for this contest! Winner to be announced soon! The winner using random.org is Laney! Congrats! Check your email inbox soon! I'll send you an email for a time that I can come by and drop off your tickets before next weekend! Enjoy Kidsfest! And thank you to everyone else who entered.